To grandmother's house Blu-ray will go this June. 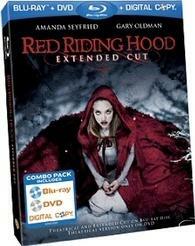 In an early announcement to retailers, Warner Brothers is preparing an extended cut of 'Red Riding Hood' for Blu-ray on June 14. The retelling of the classic fable is directed by Catherine Hardwicke ('Twilight') and stars Amanda Seyfried ('Jennifer's Body') and Gary Oldman (The 'Dark Knight' franchise). The release will be a Blu-ray/DVD/Digital Copy combo pack with 1080p video, a DTS-HD Master Audio 5.1 soundtrack, and supplements include deleted scenes. Blu-ray exclusives include: Secrets Behind the Red Cloak" PIP w/ C. Hardwicke, A. Seyfried, S. Fernandez and M. Irons; "Reinvention of Red Riding Hood"; "Red Riding Hood's Men"; "Making of the Score"; "Before the Fur...Making of the CG Wolf"; Casting Tapes; Rehearsals; Music Videos; "Red Riding Hood in 73 seconds"; "The Wolf Goes to a Hamlet Audition" Easter Egg; and a Gag Reel. You can find the latest specs for 'Red Riding Hood' linked from our Blu-ray Release Schedule, where it is indexed under June 14.